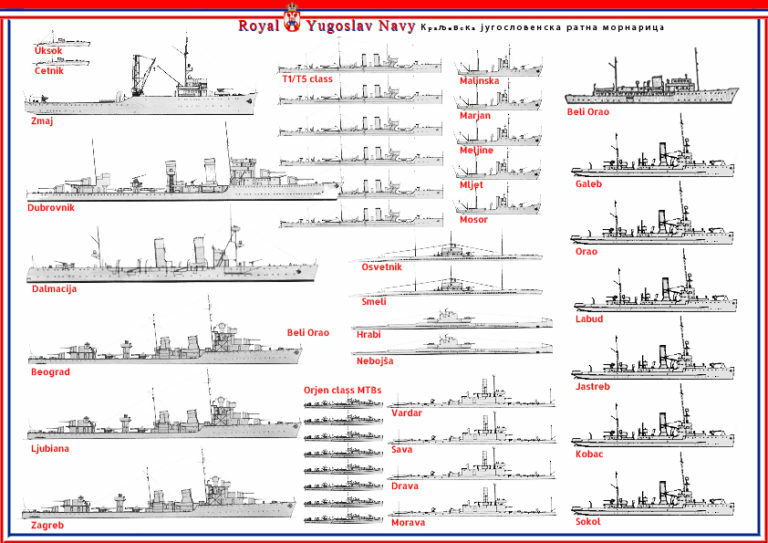 The following images illustrate the most important classes of warships that were in service with the navies of Yugoslavia, Greece, Poland and Finland during the World War II. All the images are created by www.naval-encyclopedia.com. In that page you can read some excellent naval history articles, to download other graphs or you can purchase the same graphs in high resolution in the online shop! 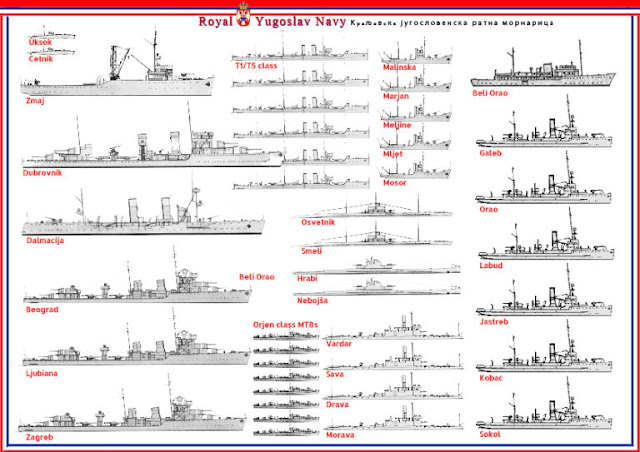 More posts will follow for your collection of current naval fleets but also of fleets from the past. Following Japan's defeat in World War II, the Imperial Japanese Navy was dissolved by the Potsdam Declaration acceptance. Japan's 1947 Constitution was drawn up after the conclusion of the war, Article 9 specifying that "The Japanese people forever renounce war as a sovereign right of the nation and the threat or use of force as a means of settling international disputes." The prevalent view in Japan is that this article allows for military forces to be kept for the purposes of self-defense. 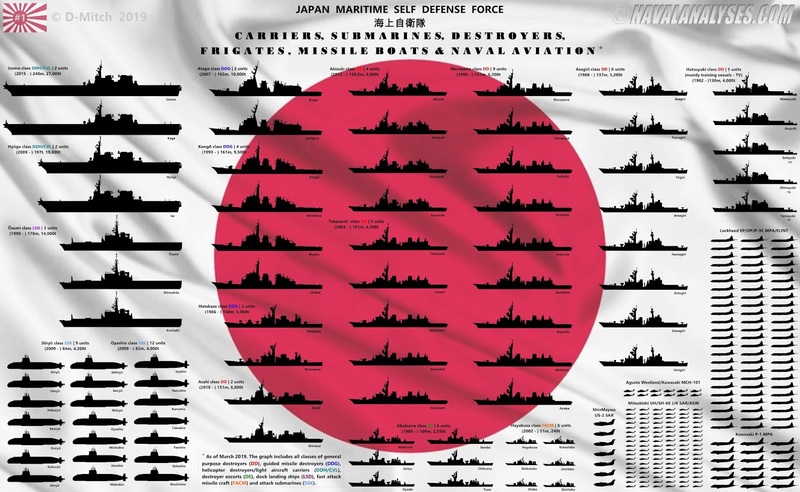 In 1954, the JMSDF was formally created as the naval branch of the Japan Self-Defense Forces (JSDF), following the passage of the 1954 Self-Defense Forces Law. The first ships in the JMSDF were former U.S. Navy destroyers, transferred to Japanese control in 1954. In 1956, the JMSDF received its first domestically produced destroyer since World War II, Harukaze. You can read more about The evolution of Japanese destroyers after WWII. 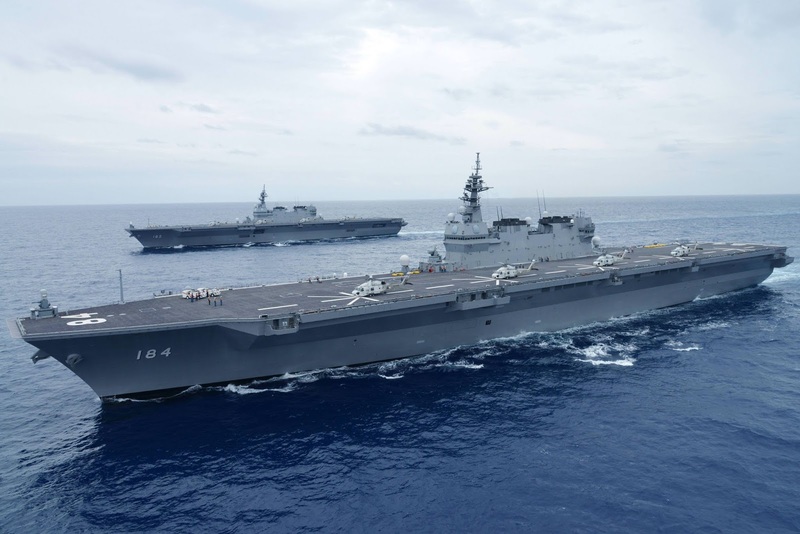 This FLEETS post is devoted exclusively to the Japan Maritime Self-Defense Force today, one of the most powerful navies on the planet. The Japan Maritime Self-Defense Force (海上自衛隊 Kaijō Jieitai), JMSDF, also referred to as the Japanese Navy, is tasked with the naval defense of Japan. The JMSDF has a fleet of 154 ships and 346 aircraft and consists of approximately 45,800 personnel. The first graph (G #1) includes all the carriers, submarines, destroyers, frigates, missile boats and naval aviation (ASW/SAR/MPA/ELINT) that will be in active service by March 2019. The.. "offensive" force if I may say. 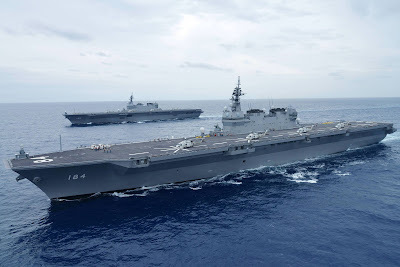 Note that in December 2018, the Japanese Cabinet gave approval to convert both 248-meter Izumo-class helicopter destroyers into aircraft carriers capable of operating the F-35B STOVL fighter! A second graph (#2) will follow soon in this post, whith all the replenishment ships (5 ships), mine countermeasure vessels (25 vessels), landing craft (9 craft), training ships (8 ships) and other auxiliaries. Japan Maritime Self Defense Force today (G#1). High resolution image here.